Active in the neighbourhood since 2012, TNDG is well-known for growing free food through its Incredible Edibles initiative that builds and maintains raised-bed gardens on a few of the area’s main thoroughfares during Montreal’s growing season. Also popular are the group’s film and discussion evenings, held once a month from October through June at Coop la maison verte. 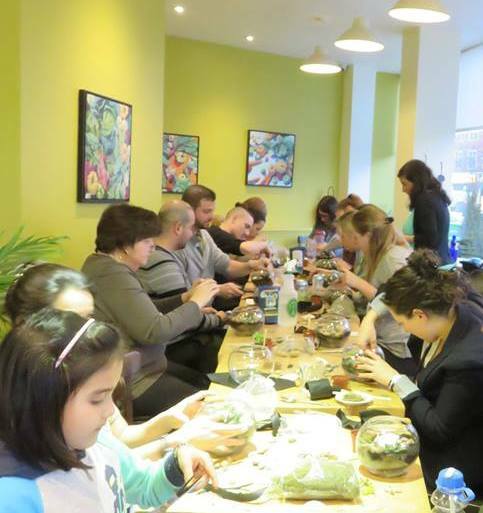 A group of NDG residents take part in a terrarium workshop at Café Zephyr. learning about and practising disaster preparedness to foster community resilience. The Pop-Ups also will spearhead TNDG’s membership drive, as the group is eager to expand its activities and welcome newcomers into the fold. The group is a not-for-profit Cooperative and all monies collected go towards maintaining ongoing projects and funding new initiatives. A percentage is also earmarked for the eventual purchase of space the Cooperative wants to share with the community that has been very welcoming to this Coop Without Walls. For more information on the Pop-Ups, please visit the Transition NDG Facebook page. To find out more about the Cooperative de solidarité Transition NDG, visit their website. I translate, write copy, create and manage content. A self-motivated and autonomous team member, I can take your project from inception to implementation. I pride myself on being an effective and trustworthy ally to my clients and collaborators. - Je traduis, je rédige, je gère et je crée des contenus. Autonome et motivée, je sais porter vos projets de la conception à la réalisation. Ma plus grande fierté est d’être pour mes clients et collaborateurs une alliée efficace et digne de confiance.